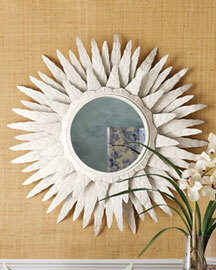 The Collected Interior: DIY...Sunburst Mirror! I know you've seen them everywhere in the design world...Sunburst Mirrors! Those chic little mirrors that can bring texture and sparkle to any ole' room... such a fun trend. But often the price tags aren't so fun. This one above sells for $295...ouch! Well here's one you can make for a whole lot less. Yup, the Nester from The Nesting Place whipped up this beauty for under $25. Ahhhmazing! Love it's simplicity and modern shape. Ahhh, knockin' off the popular Sunburst Mirror trend? Seriously, DIY doesn't get any more fun! Click here for this fabulous tutorial! I like the one from the Nesting Place sooo much better anyway. I agree...love this knock off! And love Nesting Place too...such a great blog! This is so cool, thanks for sharing. Love it in that setting - not so sure it would work in my old house but it looks so fresh and mid-century modern there! аnd аnything and everything in its plаce'. Prepare the area where you are going to be undertaking the colorng. * Chinese pizza: Top unbaked pizza dough with hoisin sauce, sliced environmentally friendly peppers and onions, and sauteed shitake mushrooms.